My kids love all Clare Freedman’s Underpants books but I think the alien themed one is probably our favourite, rhyming stories are always a hit with children and anything that might count as slightly rude or cheeky is always a winner with my kids too! 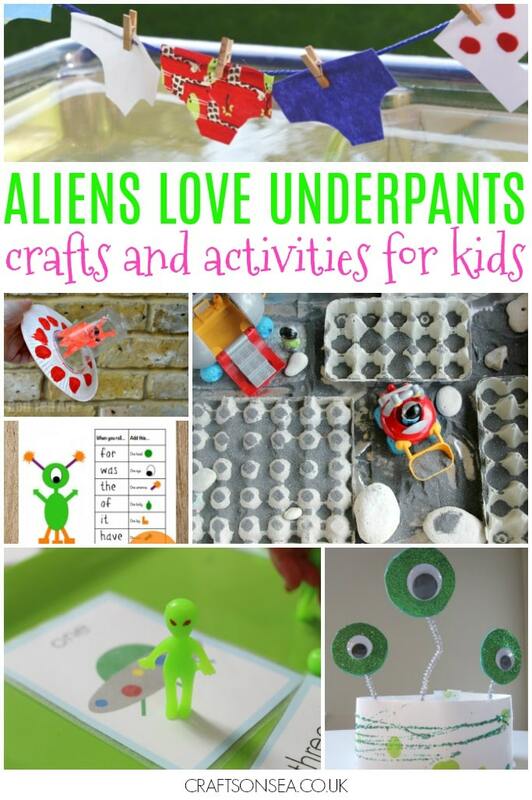 These Aliens Love Underpants activities and crafts are loads of fun with alien dressing up ideas, a flying saucer craft, maths activities, easy alien crafts and a cool small world play idea. No Time for Flashcards shares this great and super easy alien dress up idea. I love it when I see an activity and know that I’ve probably got everything I need for it! This lunar landscape small world sensory play is from The Imagination Tree. All aliens need somewhere to hang out after all!Finally I love this watercolour galaxy from Hodge Podge, perfect for our aliens to fly through. These books are a firm favourite in our house so will definitely be trying out some of these! I’ve absolutely loved this series of yours! Such a wonderful idea. I reckon you should make a regular feature of it…. the lunch looks like fun! back to school so it is nice to work on some exiting foods again. My boys got this book for their birthday and they love it. They would love to make the alien hats! If we have another rainy day I know what we’ll be doing now! We’ll be using the play doh idea this week, we love this book! ooh thats a great round up of activities. I always enjoy reading these. 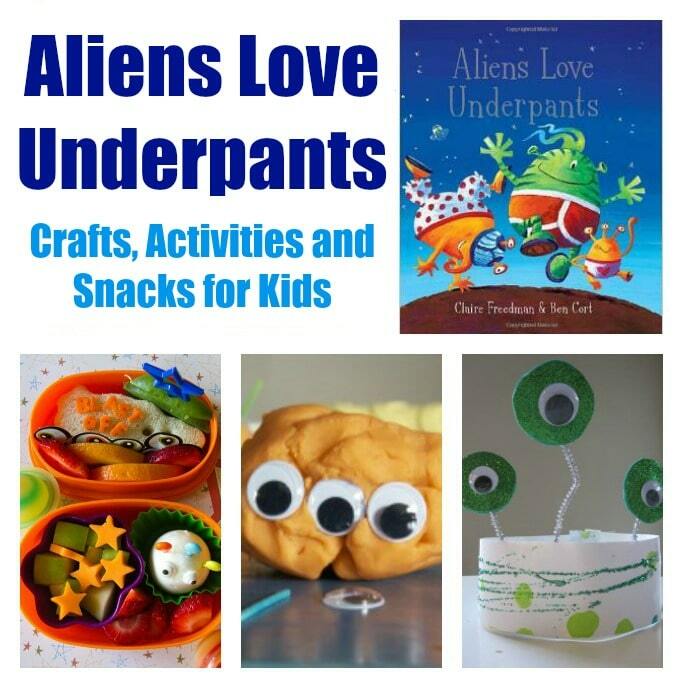 I haven’t read Aliens Love Underpants in years which means my son hasn’t had the joy of this book. I must get hold of a copy! Mine had this as a theme when they were in Reception and did some of these activities. Great choice. Great books, and I’m loving those craft ideas. Some fun and fantastic ideas there. The galaxy of stars looks beautiful. We love this book and I love those craft ideas around it. Brilliant! I love love this book . It is a reception form favourite. So many fun activities! Sounds like this is a really great chidren’s book!